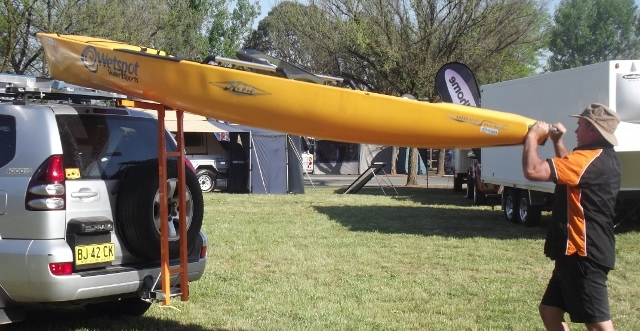 The StrongArm Kayak Loader is the answer for safe and easy single person loading canoes or kayaks onto a vehicle roof. Made from powder coated aluminum with a steel base that locates over a 50mm tow ball, it is held in place with Tee bolts that hand tighten against the tow bar. This secures the StrongArm during the loading and unloading of a kayak but enables the StrongArm to be quickly removed from the car when finished (takes about 15 seconds). 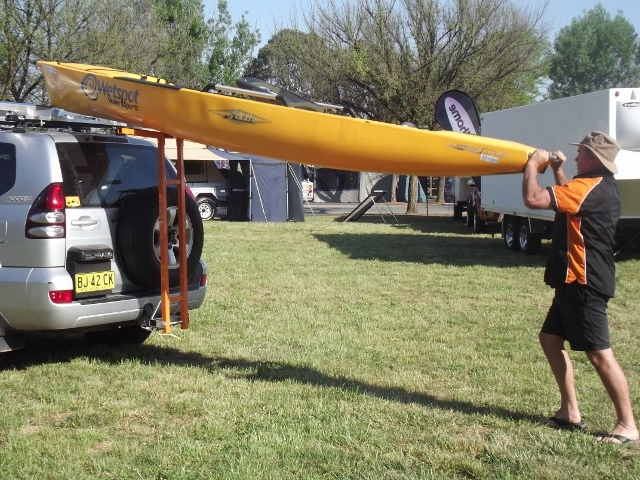 The StrongArm can be adjusted up to 1.6m above the two ball in height and suits vehicles from sedans to 4WD's and vans. It is designed to sit about 50mm below the roof rack level. 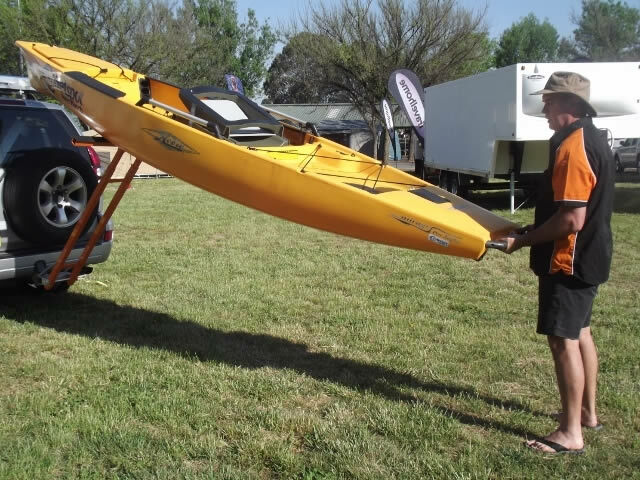 Simply attach the StrongArm kayak loader to the vehicle, lay it back at 45 degrees, sit your kayak on the cross arm, pick up the end of the kayak and walk forward. The StrongArm kayak loader will deliver the front of your kayak onto your roof rack with no chance of the kayak slipping. There is a bit of a technique to using the StrongArm but after a couple of goes you will get the hang of it. Single person operation. Ladies you can load solo. Ideal for large fishing kayaks. Winner ABC TV New Inventors March 2011 Rated to load 60kg. 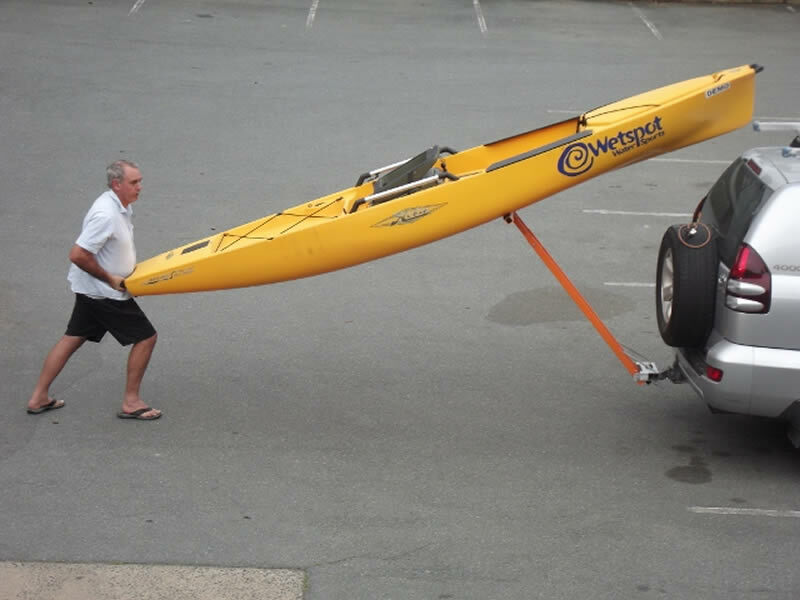 Suits kayaks up to 6m + Adds no weight to your vehicle roof. Fits all vehicles fitted with a 50mm tow bar (does not suit load distribution kit) and Maintenance free. We supply our StrongArm Kayak Loader direct to our customers so you are dealing with the manufacturer NOT a salesman. 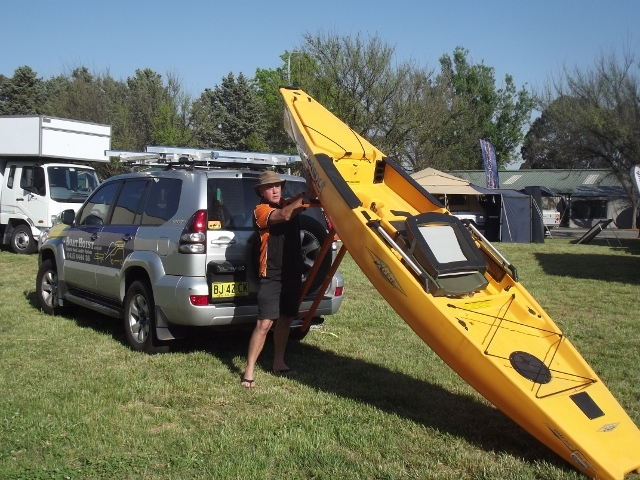 The StrongArm kayak loader can be freighted direct to your door in all Australian states or you can pick up. Does not suit kayaks less than 3m long.